The graphic of the ingredients and content is fairly standard these days. The font and colour coding for the flavour is attractive and modern. The silver bags are fabulous. However, it doesn't really work together. A silver bag with a block in the centre of the bag with the writing and graphics would be more visibly attractive and easier to differentiate the flavours. These were fairly thickly sliced Crisps. Munching through, it was noticeable that the Crisp broke up in a hard, but firm style. There was no crispy snap, but the crunch was consistent throughout. It did not melt before the crunching finished. Strangely, these Crisps were a bit disc-like. They were mostly whole, and flat. There was not much in the way of oil bubbling. There was a decent amount of reddish coloured seasoning. 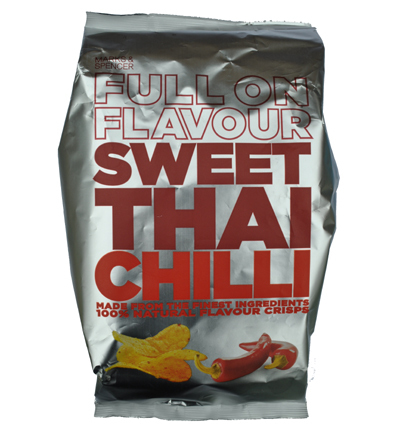 On the front of the bag it said the flavour was Sweet Thai Chilli. On the reverse it said the flavour was Sweet Thai Chilli and Coriander. Odd. The packaging designer must have got a little confused because there was certainly no sign of any Coriander in what was a really quite irresistible combination of flavours that bounced from syrupy sweet to mild chilli. It was a Sweet Chilli dip style Crisp that left an equally rewarding ginger, and maybe even lime infused Sweet Chilli after-taste.